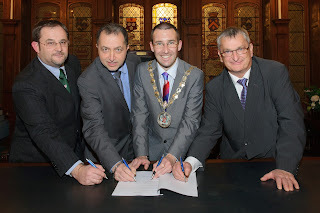 Late last week on Friday 15 November 2013 I welcomed my Mayoral counterparts from towns in Italy and France to Bangor to unveil a new European Cultural Route 'The Columban Way' based on the life and travels of both Bangor, and central Europe’s most famous Saint, Columbanus. The signing took place in Bangor Town Hall and sees the start of a process that over the next number of months will develop an application to be presented to the European Cultural Committee in Luxembourg that will see the union formally recognised as an official European Cultural Route. The initial route is to comprise of Bangor, Luxeuil-les-Bains (France) and Bobbio (Italy) and will recognise the influence of Columbanus’ work within central Europe and is to be formally established by 2015, the year that will mark the 1400th anniversary of the passing of St Columbanus. This anniversary year one that will be marked with events throughout the European countries he was influential in. After the initial route is formed it is envisaged that it will then expand to take in the additional countries of Switzerland, Austria and Germany where Columbanus also left his mark through the establishment of monasteries and settlements. Not only did Columbanus play a pivotal role in the spread of Christianity in mainland Europe but his importance both here and in Europe has been recognised in that he was the first person to use the term "European", was notably our first "man of Letters", famous for his poetry, and was the first Irish man of whom a biography was written, by fellow Monk, Jonas. The creation of this route will be a fitting testimony on a European scale to the man and his work. St Columbanus was born in Leinster circa 543AD and after spending time studying at Cleenish on Lough Erne arrived at Bangor Abbey around 558AD to study under the Abbeys founder St Comgall. Columbanus remained at Bangor for some 30 years and whilst here it is thought he composed some of his poetry that he became famous for and which often focused on nature and the universe. It was in 591AD that Columbanus left Bangor for Europe along with his fellow Saints, including St Gall the latter who would go on to establish what is now the city of St Gallen in Switzerland. The group first landed in Burgundy and worked their way through France establishing monasteries at Annegray and Luxeuil-les-Bains (one of the cultural route partners) both drawing on the austere rule and life style of Bangor Abbey. Luxeuil-les-Bains is located north of Lyon and close to the border with Switzerland. Most famous now as a spa town it was in approximately 590AD that Columbanus arrived here after establishing a settlement at nearby Annegray and went on to set up a monastery in a former castle. After falling foul of the authorities in France and being exiled the group travelled up the Rhine River to Lake Constance. Firstly a settlement was formed in Bregenz, Bangor’s twin town, before moving on to what is now Switzerland where the most famous settlement was by Gall with the foundation of what is now St Gallen. Gall would remain in Switzerland, after a disagreement with Columbanus, while the latter moved on to Italy, firstly Milan in 613AD before soon settling in Bobbio (the second cultural route partner) north of Milan where he established his last monastery and where he would stay until passing in 615AD. Bobbio also became the resting place of the Bangor Antiphonary for centuries. The book created c.690 in Bangor was based on the rules of Comgall and Columbanus, told through prayers, hymns and poems. Cardinal Borromeo took the book from Bobbio Abbey in the 17th Century to create the Ambrosian Library, Milan where it has been ever since.